I loved listening to this book a lot. The Bible has a voice. Listen. Unique among audio Bible productions, The Bible Experience is a captivating performance of the Bible presented by a stellar ensemble of today's top-name actors, musicians, clergy, directors, and award-winning producers. This historic production also features a cinematic musical score, unparalleled sound design, and the highest production value. The Bible Experience is truly theater of the mind and spirit. Yolanda Adams, Erika Alexander, Tatyana Ali, Tichina Arnold, Essence Atkins, James Avery, Angela Bassett, Bill Bellamy, Reverend A.R. 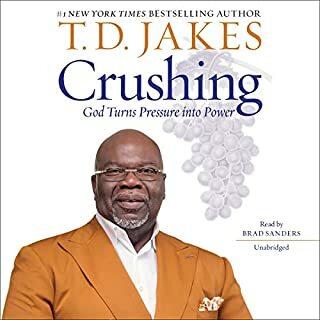 Bernard, Bishop Charles Blake, Pastor John Boyd, James Brown, Jim Brown, Wren Brown, Levar Burton, Dr. Juanita Bynum, Shirley Caesar, Vanessa Bell Calloway, Common, Terry Crews, Pastor Billy Davis, Loretta Devine, Gary Dourdan, Charles S. Dutton, Idris Elba, Faith Evans, Kim Fields, Kirk Franklin, Tyrese Gibson, Meagan Good, Cuba Gooding, Jr., Robert Guillaume, Jasmine Guy, Anthony Hamilton, Hill Harper, Taraji P. Henson, Dule Hill, Bishop Donald Hilliard, Jr., Pastor Billy Ingram, Samuel L. Jackson, Bishop T.D. Jakes, Cheryl "Salt" James, Star Jones, Boris Kodjoe, Nikki Kodjoe, Eriq LaSalle, Harry Lennix, Dawnn Lewis, Tommy "Tiny" Lister, Victor Love, Derek Luke, Tisha Campbell Martin, Judge Greg Mathis, Bishop Clarence McClendon, Donnie McClurkin, Lana "MC Lyte" Moorer, Mo'nique, Garrett Morris, Phil Morris, Mya, Dwight "Heavy D" Myers, Keke Palmer, CCH Pounder, Pastor Larry Powell, Daphne Reid, Tim Reid, Latanya Richardson, Richie Righteous, Wendy Raquel Robinson, John Salley, Bishop Kenneth C. Ulmer, Blair Underwood, Iyanla Vanzant, Bishop Joseph Walker, Denzel Washington, Pastor Marvin Winans, Alfre Woodard, Charlayne Woodard, and Jeffrey Wright. Don't miss Inspired By...The Bible Experience: Old Testament. This is the third Bible that I've downloaded from Audible.com and this is by far the best. 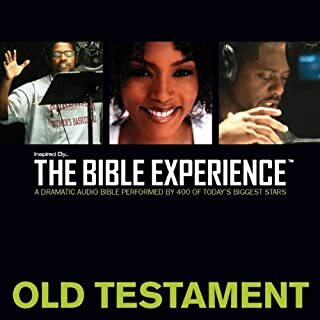 It is easy to understand and is interesting and captivating, particularly the Old testament.It has good sound-effects and different character speakers.The speakers speak at a normal pace so that the listener has time to understand what is being said, which is good for me because I don't like it when people talk too fast. I am waiting to get a better listening device so I can listen to it in sound quality of 4. Right now my present device only will accept a sound quality of 3. But never the less, it is still good enough. It is my favorite and is great when I have insomnia and want something to listen to or just during the day when I am relaxing. I would rate it as 6 stars but since there are only 5 stars, thus I rate it a 5. What did you love best about Inspired By...The Bible Experience? Good Content but lacking quality. After listening to the sample, I was excited to download The Bible Experience and start listening to it. I was disappointed that the audio quality did not sound as good as the sample. I really wish audible.com used a high quality encoding process instead of their current 32kbps 22khz setting. Most of the time the lower bitrate is fine for spoken word audio but since this book contains spoken word mixed along with music and sound effects, the lower quality bitrate sounds like listening to it on a AM Radio. May be best to purchase the physical MP3 CD version since it is encoded at a much higher quality. Where does Inspired By...The Bible Experience rank among all the audiobooks you’ve listened to so far? I can't believe that you can purchase the entire New Testament for only 1 credit. This audio book is an astounding re-creation of the NT. I enjoyed the background affects, it makes you feel as if you were there observing. It stirred my soul and I could better understand what the different passages were trying to say because of the quality of the narrators acting. This was well done! My husband and I listened to the new testament on our road trip this summer. We found that the time flew because we were so involved in the stories of the Bible. It made it real to me. The emotions conveyed by the voice actors were well done, rarely corny (although there were a few times). The only negative thing was that the background music and noises sometimes detracted from the story rather than adding to it. All in all, well done! The dramatization is great. However, if you want to listen to a particular book you are out of luck. It is not, that I can see, search-able so if you want to just listen to Romans then it's hugely time consuming to find. Wish I had known that before I purchased it. I am somewhat disappointed. I have purchased a few audio Bibles in the past, this blows everything else away. This is Hollywood movie quality. The background noises and the recognizable voices they use make the experience very enjoyable. I listen to the Bible every day when I get ready in the mornings now, best thing I've purchased through audible. This is a semi-dramatised version featuring some of the biggest names in Hollywood. It brings the Scriptures to life and is unlike any other audiobook of the Bible you'll have heard to date. I enjoyed the energy in this and found that it carried you along with enthusiasm and actually got me 'feeling' the book rather than reading it (if that makes any sense). Highly recommended for those who are finding their path and attempting to read the Bible for the first time, young people, and anyone who want's a new breath of life from the book. WOW! When I heard the New Testament I couldn't wait to also heard the Old. It's amazing! I can listen to it on long bus trips, the school runs and on the treadmill. If you have trouble comprehending the Bible or just want a fresh way to learn God's Word, I strongly suggest this.Hands-Down the Finest Audio Bible You Can Own.Good for teenage children.This product is very well done with music added to the recording for effect. Excellent a must have. I love this ... wonderful presentation. I really like this audio bible, from the very start is pleasure to listen to and follow. The Narrators are very well know famous people which adds to this Audio Books popularity I guess and they do deliver the readings very well as expected. The Music throughout is not intrusive since it does not continuallu play on on some readings of scripture and never it seems when it's not appropriate. The music and sound effects are great and give the whole experience of listening a certain comfort and enjoyment. The Music and Sound Effects also help with concerntration as without music and somebody just rambling on for hours on end, it can be easy to switch off or hear what's being said but not listen to it. All this said this is by far one of the very best Audio Versions of the NIV Bible around there are even various well known Christian Online Stores that are promoting and selling it. A Very big thank you and congratulations to all those who created it,may the lord be with you all. I love this! I just don't want to turn it off. It is especially good for dramatic books like the gospels and Acts, but it's even bringing books like Romans to life for me. I'm sure this is going to be part of my daily routine for years to come. This was recommended to me by a friend and I am so pleased with it. It is excellent and I would highly recommend it to anybody who is interested! Such a lot of work has clearly gone in to recording 'The Bible Experience' and I believe it will be a blessing to those who enjoy listening to/reading God's word. i love the entire experience of New Testament. they got dramatized reading n gospel performances. A really great reading of the New Testament. The only bug being that it seems to be in a random order. It would be good if it followed the order of the New Testament so it would be easier to find particular books. Such an amazing experience, thank you! It kept me interested and was easy to listen to. I'm sure I'll listen to this audiobook many more times. Awesome.....divine....well worth the time & money. Isaiah and songs of songs had some of my favourite performances. But i still enjoyed the whole audiobook..This helped me to stay on track with my bible reading goals.